“The idea was to have guests really feel as though they were visiting a great country house,” says interior designer Wendy Hodgson, on the update of the Inn at Castle Hill. The origins of the Inn at Castle Hill, in Ipswich, go back more than 150 years. While nods to the building’s architectural origins abound, guests today bask in an oasis of comfortable elegance. Originally built as a farmhouse in the mid 1800s, the structure was expanded into a larger shingle style “cottage” in the 1890s for businessman John Burnham Brown. A decade later plumbing magnate Richard T. Crane Jr. purchased the house and the property’s surrounding 2,100 acres. Crane and his family lived in the cottage while their 59-room David Adler-designed Stuart-Style mansion, known as the Great House, was being built up the hill. The Trustees of Reservations acquired the entire Crane Estate in 1949. While much effort was put into restoring the Great House, the cottage fell into disrepair over the years. “It was a decrepit house for raccoons,” says David Beardsley, director of enterprise for the Trustees of Reservations. In 2003, the Trustees received funding that allowed them to bring the cottage back to its gracious 19th-century appeal. 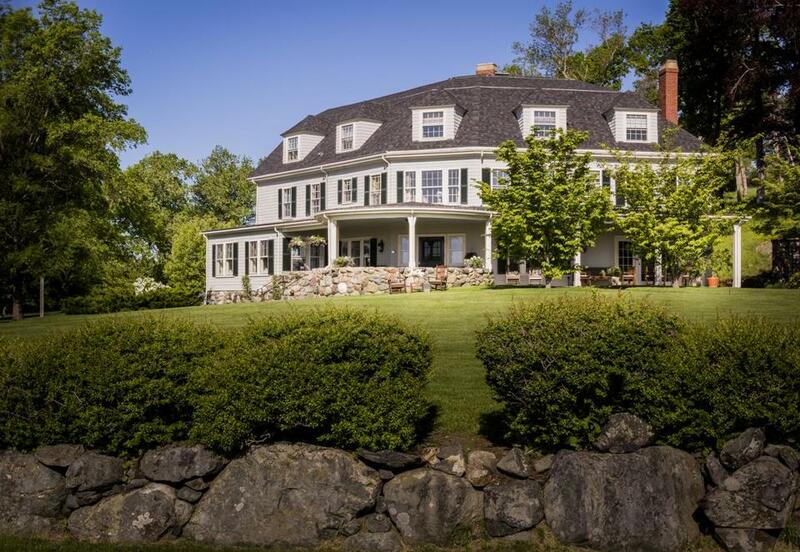 Essex-based firm Carpenter & MacNeille designed the ambitious restoration, which focused on transforming the building into a 10-guest room bed and breakfast. At the time of the initial renovation, a designer show house was held and several interior designers set the scheme for the guest rooms and common areas. After more than a decade, however, the Trustees felt the inn was in need of a refresh to maintain the luxurious atmosphere. Again, Carpenter & MacNeille came on board. Interior designer Wendy Hodgson took the lead on a top-to-bottom refresh of the interior spaces. Since there was a limited budget for the project, Hodgson used as many existing furnishings as possible and focused on bringing the outdoors in by infusing the spaces with colors and textures visible in the surrounding landscape. “The idea was to have guests really feel as though they were visiting a great country house,” says Hodgson. A few strategic new purchases were made and some furniture was reupholstered; others came from a trove of early 20th-century furnishings and antiques from the Doyle Estate that was recently bequeathed to the Trustees after the redesign had begun. The new scheme for the living room was set by a 1910 Sarouk rug from the Doyle Estate that bursts with an array of colors: tan, blue, green, rusty red. 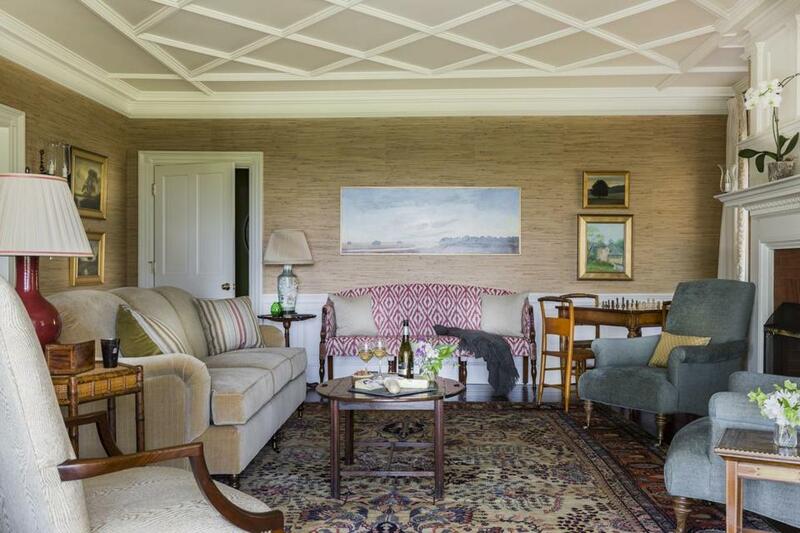 Walls are covered with Zoffany grass cloth and a Federal style mahogany settee. To add a little fun, Hodgson had the piece reupholstered in ivory and brick geometric fabric by Kravet. Club chairs sheathed in dark aqua blue fabric are from Mitchell Gold. A contemporary oil landscape painting by John McAdam hangs over the settee. Finished with white wainscoting, nickel sconces, and pedestal sinks, bathrooms have a brushed clean appeal. This one is painted a vibrant Calke Green by Farrow and Ball that recalls the verdant lawn outside. 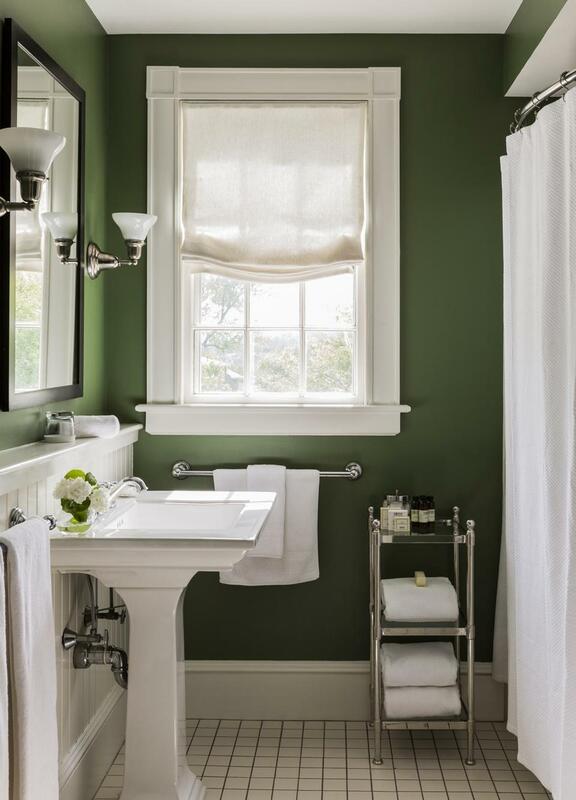 In keeping with the casual elegance of a country estate, calmer cotton roman shades replaced ornate draperies in all of the bathrooms. “They are beautiful but simple,” says Hodgson. They are also durable, as the update also revolved around installing aspects that hotel guests could use regularly and not damage. New nickel and glass Etageres from Pottery Barn provide handy perches for toiletries.